Depressed? Try sky-diving!! – The brain is sooooo cool! 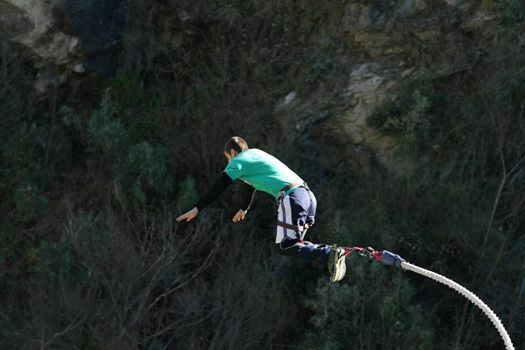 The author’s nephew takes the leap, bungee-jumping in New Zealand. I just started my annual teaching of Medical Neurobiology to University of Chicago Pritzker medical students. In the first day-overview, I wanted to drive home the point that body and brain work together to produce emotion and affect. Pointing to the picture above, I said, “Clearly, my nephew cannot be depressed in this moment; nor is he likely to solve a complex math problem. At this moment he’s all in, fully committed to his action of jumping.” I went on to show other states that are only congruent with a limited set of actions: slit-eyed drowsiness (in cat Gris-Gris) is congruent with sleep but not hunting; arched back, piloerection (in cat Tula) with hunting but not sleep and so on. After class, one of my teaching assistants told me that he’d read that people that attempted suicide by jumping and survived, report that they lost their depression upon jumping, that the act of jumping jolted them out of depression. Maybe a lightning strike of sympathetic activation, which is inevitable when flying through the air at a rapidly accelerating speed, antagonizes depression. In the case of the Golden Gate bridge, a jumper’s speed of travel at impact is estimated to be over 70 mph (110 kmh). Could an instantaneous and complete activation of the sympathetic nervous system really act as an antidepressant? Could it act in a similar way to electroconvulsive shock or ECT (the T is an abbreviation for therapy… one can always hope)? For most, spritual and empathic feelings for others continued into their post-jump lives although one survivor attempted suicide again. We have known for a long time that we humans are inaccurate when we try to explain the motivations for our actions. A great example of this is described by Nisbett and Wilson (1977) as they reviewed work by Norman Maier (Reasoning in humans II: The solution of a problem and its appearance in consciousness, J Comp Psychol 12:181-94, 1931). Maier brought subjects into a tool-cluttered laboratory room and asked them to tie together two cords hanging from the ceiling. These cords were a distance apart from each other and could not be simultaneously reached by a subject standing in one place. As Nisbett and Wilson write, “After the subject had been stumped for several minutes, Maier, who had been wondering around the room, casually put one of the cords in motion. Then, typically within 45 seconds of this cue, ” the subject would swing one of the cords so that it moved as a pendulum, thereby solving the problem. Experimenter setting a cord into pendulum-motion – OH NO!!! What is the take home lesson? We know not why we do what we do. As I will discuss in a future post on Gazzaniga’s book entitled Who’s in Charge? (Ecco, 2011), it appears that first, we do stuff; and then afterwards we make up a reasonable post hoc explanation for our action. In essence, our actions are subconsciously motivated and our explanations are simply sounds-reasonable-justifications that we consciously work out after the fact. There are truly amazing examples of this phenomenon in split-brain patients and in individuals with certain disease states (these too will be discussed in that future post). What is the relevance of all this to suicidal jumpers who survive? If despite our most earnest introspective effort to explain ourselves, we are flat out wrong in many, possibly most, instances, then it is possible that the spiritual experiences described by surviving jumpers may be inaccurate. I think this is not only possible but actually probable. Spirituality is highly cognitive. Articulating a one-ness with the universe or with God; subscribing to religion, or placing oneself in the hands of a “higher power” all require neocortical processing. I simply don’t believe that there was enough 1) time; or enough 2) cognitive capacity in the moment for jumpers to reason their way logically to any perspective, spiritual or otherwise. Nonetheless, I think that the jumpers’ reports make clear that jumping yanked depressed individuals out of their suicidal states. The switch from suicidal to “extreme calm and peace” (Rosen 1975) happened very rapidly and it happened under great duress when cognitive function would be expected to be off-line, not available. What could account for the switch? I think the answer is the body-brain connection that gives rise to embodied emotion. Just as our feelings lead us to act, our movements influence how we feel. When we cross our arms, we are less open to what another is saying. When we frown, we are less likely to find something funny. When we are hysterically laughing, we don’t get angry. And, to return to the topic at hand, I imagine that upon jumping into space with no safety net, exhilaration would happen automatically, instantly replacing any existing feeling including depression. Shortly after teaching, I happened to meet a young scientist who as it turns out is a job candidate. I will call this individual CA. We were talking and through a path that I cannot re-construct, I related my experience with showing my nephew bungee-jumping and learning from Alex that jumpers lose their depression upon jumping. CA paused and said with a moment of hesitation, “This is probably too much information and inadvisable to share given the circumstances but….” Without looking back, he then launched into a story that started with a devastating break-up during college and the resulting heart-break. During the ensuing moths, CA did not go out and was in a serious funk. Friends, growing concerned and wanting their friend back, insisted that CA accompany them on an outing to go…. sky-diving. Off they went and even when in the plane, CA’s attitude remained one of depressed tolerance, a “whatever” fatalism. Luckily, beginner sky-divers jump out with an instructor and it is the instructor who pulls the rip-cord for the parachute. So CA’s turn came and the pair – CA and the instructor – jumped out. CA instantly felt alive and excited. By the time that CA hit the ground, the heartbreak was gone, vanished, never to return again. Today depression is treated with psychotherapy, pharmacological therapeutics, and in intractable cases, with ECT. Maybe, sky-diving and its dare-devil, thrill-providing relatives such as bungee-jumping warrant inclusion as one more weapon in the anti-depressant arsenal. “electroconvulsive shock or ECT (the T is an abbreviation for therapy… one can always hope)?” ; well said (RE “one can always hope”). I say that as someone who particpated in and watched such while working at the South Florida State Hospital in Hollywood ,FL. Thanks a ton for that “ubetchaiam”!! Interesting reading. The gist that I take away from this skydivers’ forum is that skydiving feels good but it’s not enough to get one over clinical depression. And some people love skydiving so much that they get depressed during the week when they have to work or when the weather prevents them from skydiving on the weekend. I don’t think Evolution favors suicide, so under extreme sky-diving conditions there maybe survivor neurotransmitters that kick in. On the other hand I think Evolution favors the species not the individual so we are not designed to have millions of senile folks around to take care of..that is why we have cancer and heart disease. Folks should be allowed to die. I’m with you on this…..nature is to be allowed to do its job. If depression is also reflective of the emotion ‘disappointment’ (which psychologists and buddhist philosophy would trace back to ‘expectations’) , then this study and further research along the lines of the study could be useful in addressing such mental illness. And suicide is a mental illness, NOT ‘nature’. No one said that suicide is Nature, quite the opposite, “survivor neurotransmitters” for extreme conditions. Maybe the Basal Ganglia gets a lot of dopamine and ones mood gets better. The University in the area where i live just got some grants for the Brain Research through Advancing Innovative Neurotechnologies (BRAIN) Initiative. and study might provide an insight into the ‘why’ associated with the risk taking causation of depression end. Are you going to be partcipating in this research? See the Diane Rheame show Oct. 23 on the right to die with a brain tumor.